At Hamlet for the Homeless, it’s not just about number crunching, paper pushing and lobbying for this great cause! We step outside into the fresh, brisk air and take action. 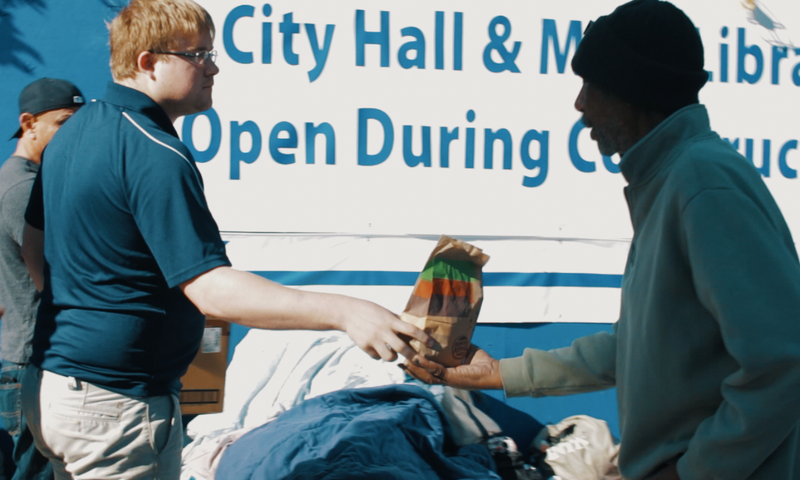 This week, we stopped by a local eatery, picked up a large order of food and headed to downtown Long Beach. The current bright-blue tarping that surrounds the perimeter of the Long Beach City Hall serves as a protective barrier for many homeless in Long Beach. The previous night’s inhabitants were clustered together in groups. We began handing out the meals along with some kind words and holiday blessings. With gratitude and the same disbelief, one woman named Letisha, introduced herself to me. She explained that the disbelief stemmed from being continually ignored by the passing professionals and visitors who walk by daily. “These people pass us by, they don’t even look at us in the eye. We’re lower than their warm pets at home,” she said. Having the hard truth laid out so plainly made me reconsider the recent craze over the social experiment #smileback, where people smile at as many strangers as possible. The power of a smile has been researched and documented on the affect it has on both the smiling person as well as those encountering the random smile. The next time you’re out and about, imagine the impact you can have on a complete stranger, someone down on their luck, hungry and homeless, by offering a smile and something to eat.